Dice the onions and put into a heavy bottom pot with the butter on medium heat. Stir often and cook about 40 minutes until deeply browned. Meanwhile, chop the cheese into 10 cubes and split the beef into 10 equal parts. 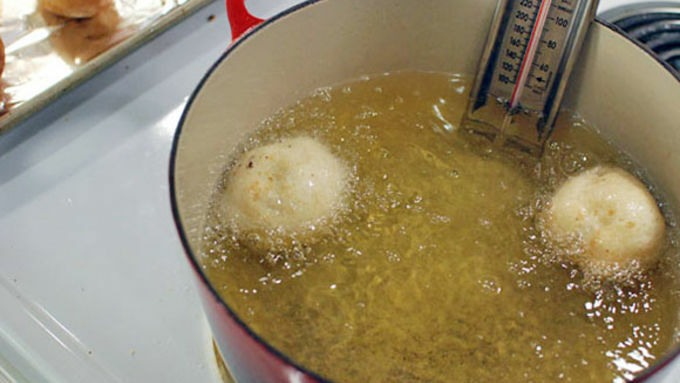 Begin to heat your oil to 350°F. Grab one piece of the beef and flatten it with your palm. Place a chunk of cheese onto the center of the beef, along with about a half teaspoon of the onions. Wrap the beef around the fillings and seal it. Broil the meatballs for about 7 minutes, flip, and broil another 5 minutes. Pat the meatballs dry and allow to slightly cool. Get the bread dough out of the fridge and open the container. Slice the dough into 10 equal parts. 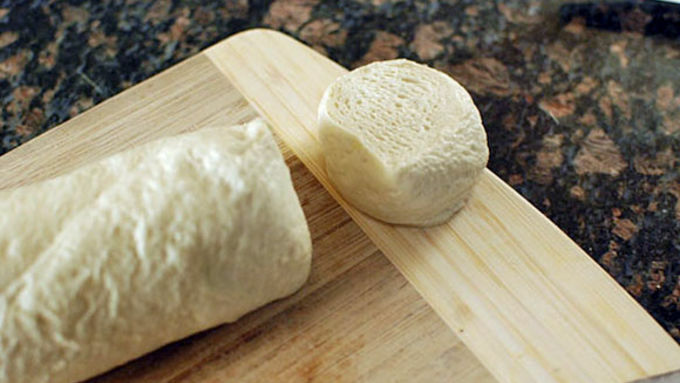 Flatten the segment of dough in your hand and wrap it around the meatball, being careful not to break the dough. Try to keep the dough even on all sides of the meatball. Repeat with remaining meatballs. Fry at 350°F for about 5 minutes, rotating to brown evenly. Serve with ketchup and mustard to dip. This is truly fair food at its best. If anyone wants to open a stand at their local fair and sell these things, be my guest. You will probably make millions! Just promise me – if I show up at your stand I get a couple free ones, okay? 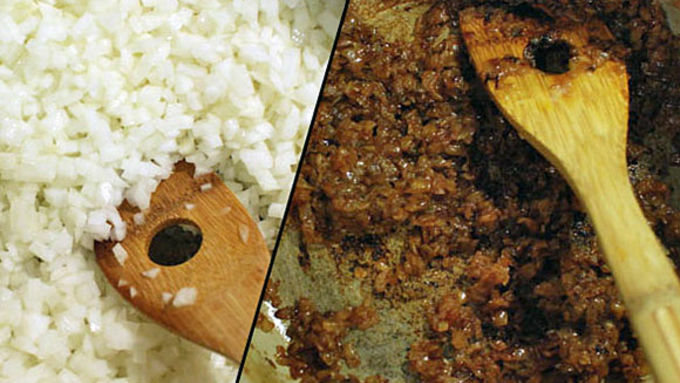 Other than their fried awesomeness and pop-able nature, what makes them great is the caramelized onions. Deeply browned onion is actually the key to making any burger amazing. 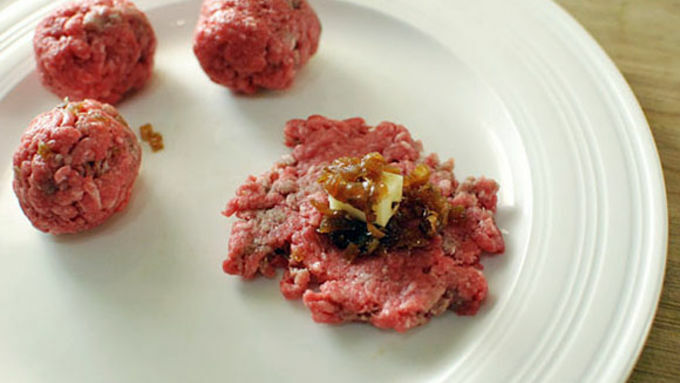 Adding them to these Fried Burger Bites makes them scream burger – instead of just being another version of meat inside bread. 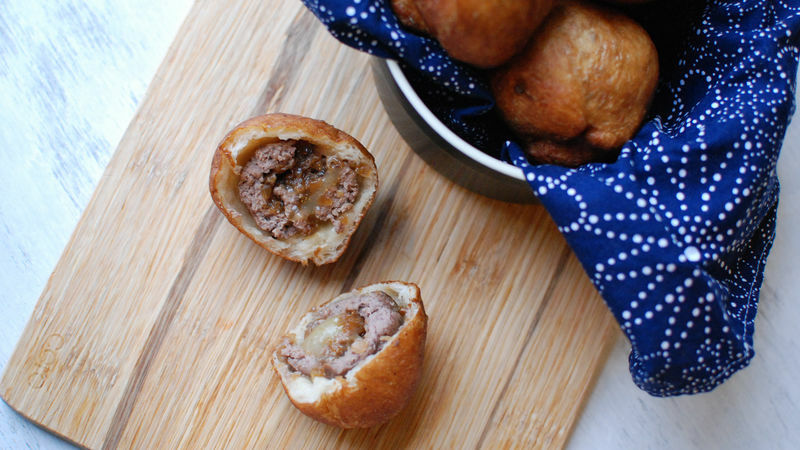 So the next time you're craving Fair food, try these Deep Fried Burger Bites and you won't be disappointed!